Thanks to the kind folks at Whittard, I was able to get a chance to try this delightful single-estate tea. The tea steeps into a full-bodied, satisfying cup. Short aside before we get into the tea to comment on the description on the packaging since it demonstrates some of the intricacies of black tea – the tea advertises three interesting traits on the packaging: FTGFOP1, Single Estate, and Second Flush. What do these mean? FTGFOP1 – If you ever see these markings, this is part of the esoteric system by which black tea is graded. Check out my earlier post on how black tea is graded to learn more about what those letters mean. In this case, it means Finest Tippy Golden Flowery Orange Pekoe (Top Quality). Single Estate – This tea also is single estate, meaning that all the tea leaves are sourced from one specific region, estate, or plantation. Each region does tend to have it’s own characteristics, though in my experience single-estate doesn’t always mean better, since blends can have the benefit of balancing out a specific oddity in the flavor of a tea. Second Flush – You’ll occasionally see the terms first flush, second flush, or autumnal flush used to describe tea. Flush refers to the primary tea growing and harvesting seasons. Time periods are not necessarily fixed, since growth can depend on weather patterns. So in this case, this tea was harvested from the second growing season. Assam Mangalam 2nd Flush FTGFOP1 Loose Tea. A land of high rainfall, Assam in north east India is endowed with lush greenery and is the largest cohesive tea growing area in the world. Second flush teas from this area are particularly sought after as they possess all the best characteristics of Assam teas. Mangalam tea garden has an excellent reputation and this is a delicious full-bodied tea with the distictive Assam malty taste and long lasting flavour. Ideally warm the pot first with a splash of hot water. Use one teaspoon (around 2g) per cup and always use freshly drawn and boiled water. Allow to brew for 3-5 minutes according to taste. Can be drunk with or without milk. The Assam Mangalam makes a delightful first impression. 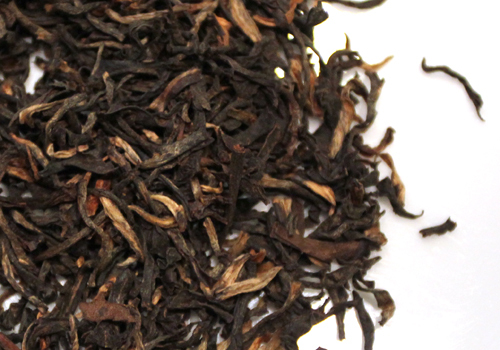 The tea leaves are uniformly sized curls of black and dark brown, beautifully highlighted with twists of wheat gold. The smell is earthy and slightly herbal. It’s a beautiful tea which steeps to a deep red gold cup. The tea is excellent, with a brisk, full-bodied taste. I found it very satisfying, without any bitterness or astringency. The flavor is rich enough to stand up well to milk and sugar but also very enjoyable on its own.